Benjamin Punnett’s favourite place to climb is the Exchamsiks sports wall on the highway between Rupert and Terrace. For Benjamin Punnett, being adventurous means climbing rocks and steep walls. For some people, being adventurous means buying the french vanilla ice cream instead of just vanilla. But for Benjamin Punnett, it means climbing rocks and steep walls. We aren’t talking about a guy who has no fear, but rather someone who describes himself as a very cautious person. “I don’t like heights so climbing is a fairly adventurous sport and you go up high so both of these things were fairly significant hurdles to me starting climbing,” said Punnett. Born and raised in Prince Rupert, the climber dabbled in the sport a bit as a kid at Devil’s Crag, Rupert’s climbing wall. He did it a bit through high school and shortly after but wasn’t too interested in it. That all changed while he was attending the University of Victoria in 2010 when a passion for the extreme sport was born. A friend of Punnett’s, also from Rupert, pestered him into going to the climbing wall there and within an hour, he was hooked. “It was very much like flipping a switch. I started doing it and I was just like I really like this. I don’t know exactly why I really like this, but I really like this and I want to keep doing it,” Punnett said. Ever since then, so much of his free time has been given to this sport, whether its climbing a wall in an indoor facility, bouldering — which is climbing boulders low the ground, sports climbing — which is when someone has put bolts in the rock ahead of time, and traditional climbing — which is when there’s no bolts but you place your own gear in the rock as protection. Punnett is also interested in getting into alpine climbing and possibly ice climbing. Clearly, it’s not just a passing interest. “I love the adventurous nature of it. It was definitely intimidating, but the ability to push yourself in a controlled manner I find very interesting,” he said. The fear of heights has lessened over time for Punnett. The first few years, it was constantly in the back of his mind when he was climbing. But he says he’s become desensitized to it a bit, but more than that, he has learned to trust himself as a climber and to trust the gear. Overcoming that fear is one of the biggest things the sport has taught him. “It taught me how to tackle a fear of heights, which I thought was an insurmountable obstacle,” he said. The other main thing climbing has taught him is how to fail. “You have to be willing to fail on it in the hopes that eventually, you will succeed. A lot of times, life punishes you quite hard for failure. You fall off all the time when you’re climbing and becoming comfortable with that was a learning experience,” Punnett said. He always planned to come back to Prince Rupert after finishing school because he missed it. But he also wasn’t willing to give up climbing. That’s when the inspiration to revive Devil’s Crag came. Between Punnett, his mother and his sister, the trio convinced the civic centre to reopen the wall under their supervision. Along with a bunch of volunteers, they still unofficially run the climbing group, although the city has hired supervisors now. Punnett’s main role in the revival was setting routes on the wall. A route is what a climber follows to the top. The Rupert wall has eight different routes on it right now, ranging from easy to difficult. Punnett was the only one with knowledge and experience with it when he moved back in 2013, so he helped the wall become more interesting and challenging for climbers. Devil’s Crag has come a long way from what it was in 2012, thanks to Punnett and other volunteers. What was once a mostly-abandoned piece of infrastructure in the corner of the gym is now open three to four nights a week and consistently sees more than 20 climbers on any given evening. Besides helping the wall get back into commission, Punnett teaches learn-to-climb classes at the civic from time to time. He also travels to Smithers twice a year with a group from Rupert for their semi-annual climbing competition. But Punnett still has some goals he hopes to achieve with the sport. Mostly, he just wants to climb other walls. “I would like to travel to different places that have different types of rock. Everywhere I’ve climbed has been sort of granitic-type rock, but there’s lots of climbing on limestone and sandstone, which is different types of climbing,” he said. Punnett is also interesting in route development, to make the sport more fun and accessible for people in this area. 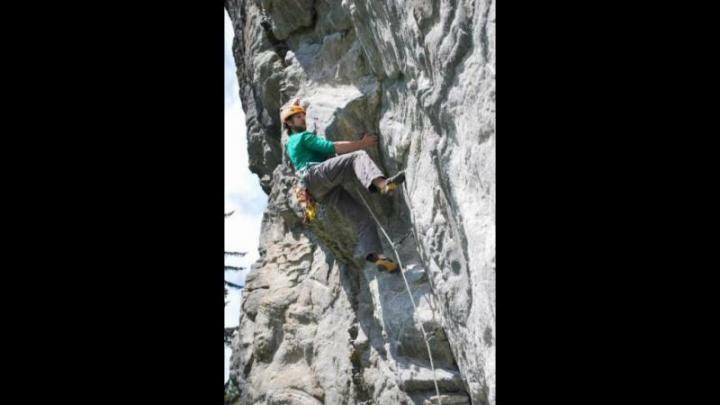 He’s climbed at various places in B.C., including Squamish, which is considered a world-class facility, Skaha in the Okanagan Valley and here in the northwest. His love of climbing in and of itself is his inspiration, but he’s not all about keeping it to himself. Punnett is passionate about getting more people in the community into climbing and making it a sport everyone can participate in and enjoy.